Sometimes I think I'm the only person in the world that is excited about Nihola cargo trikes. Could be true. So we have two Niholas. They've got different gear hubs and winter tires on them, and I swap back and forth as appropriate. (We basically only take out both trikes at the same time in the summer.) Since I can jump back and forth, I've got rather more insight into winter tires on Niholas than most. Allow me to share. 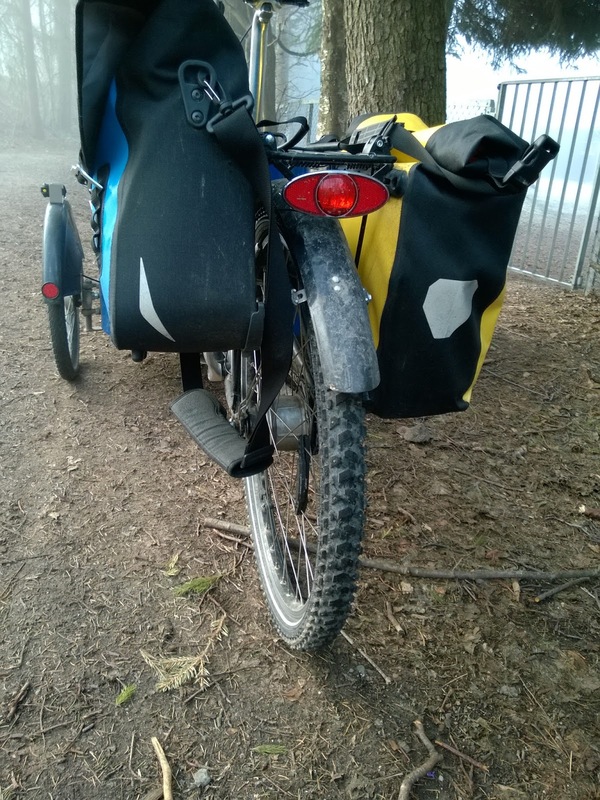 The fancy trike has a Nokian/Suomi Extreme 294 (26x2.1), and the basic one has a Schwalbe Snow Stud (26x1.9). While both are studded winter tires, the tires are in different categories. Which is to say, they can be compared, but the differences outweigh the similarities. The Extreme has way more studs and has more aggressive tread, which pays off on climbs, and on pavement it sounds like a wheel covered in velcro (especially at low pressures). The Snow Stud is mild mannered on pavement, making hardly any noise of note, wasting less energy, and doubtless lasting longer, while also being a lot cheaper. Of course it doesn't climb as well. And to be clear, the Nokian/Suomi Extreme does climb. It digs and it scratches; pure ice can possibly be climbed up to a 15% slope with something like 20kg in front 10kg in back, and low pressure. Softer stuff can be climbed beyond that, however this can require patience, low gearing, and stamina. The Snow Stud gives and spins up much sooner in almost any snowy, slushy or icy surface. The worst surface I have experienced for the Snow Stud is one that is icy and slightly lumpy, it just completely defeats the tire. I have purchased a pair of studded front tires (20x1.6 Schwalbe Marathon Winter), but not installed them. The regular Schwalbe Marathon Plus tires work pretty well on some pretty slippery stuff, and unlike on a bike, sliding the front tires is not necessarily cause for alarm. Studs would probably help, but also that adds rolling resistance and noise. I have decided that the conditions are not currently bad enough to bother swapping the tires. I would like to try a Schwalbe 26x2.0 Marathon Winter in back. Looks like a great choice for ice, or even pavement, but its harder to say if it can dig well enough in snow. One of the problems I've had with the Snow Stud is that it won't dig sufficiently in some types of dense slushy snow. Sheets of ice may or may not be a primary concern, and the Snow Stud is priced fairly low, so it could be that the humble Snow Stud remains the best trike tire for reasonably flat places with reasonably mild winters. Still running the Snow Stud, and its pretty harmless on pavement. Really not a bad tire for insecure weather. A Schwalbe Snow Stud is happy even with no snow in sight.